The very open and airy interior of the Kitchen Door, featuring a long communal table down the middle. 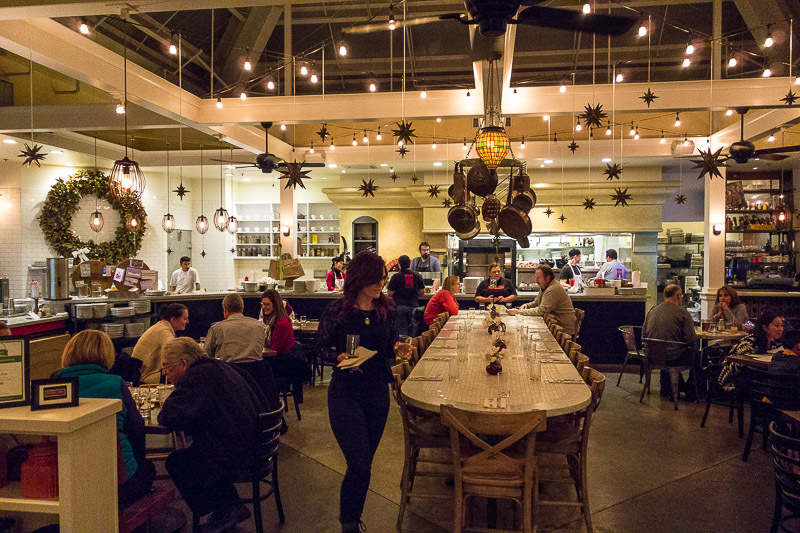 Dinner last night with Mike and Gretchen at the Kitchen Door, inside the Oxbow Market in Napa. Everything in the Oxbow is upscale, gourmet, modern and super-duper chi-chi, and the Kitchen Door fits in perfectly. A very hip restaurant with “door” in the name and a decidedly Asian flair makes me think of the Slanted Door in San Francisco, but there doesn’t seem to be any connection. The menu is wildly eclectic, ranging from burgers to wings to Singapore Noodles, Pad Thai and whole grilled fish. If you can’t find something to like here, you may have an eating disorder. 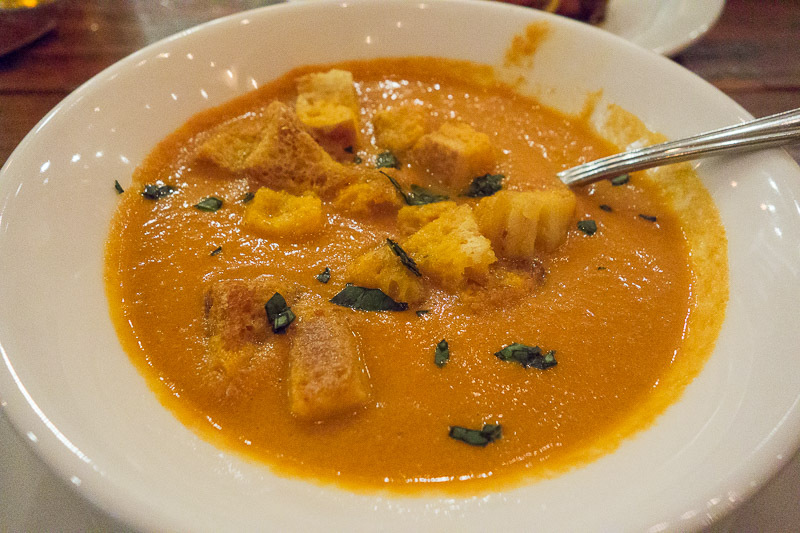 I started with the Spicy Cream of Tomato Soup, which wasn’t exceptionally spicy thank heavens. The soup was thick without being overly rich, more like a heavy foam. The croutons had just the right amount of crunch and the basil added a fresh garden zing. A very good starter. The one wing I managed to snag amid the flying forks at the table. 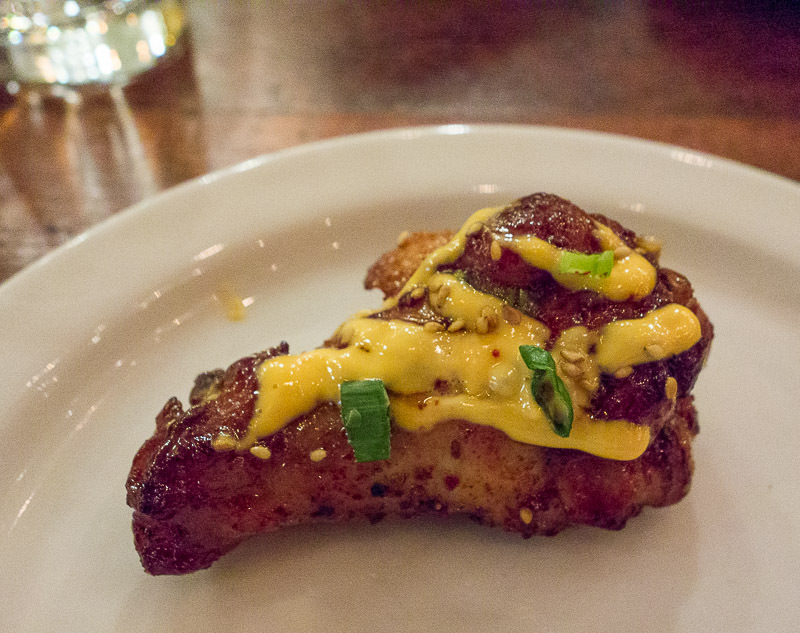 Chicken wings are a standard item these days, but they are very different here. No tomato sauce, not insanely hot so guys can show off their macho tastebuds, these are teriyaki glazed and napped with a spicy mayo. Probably not manly enough for watching football, they are better suited to wine drinkers. The way it should be in Napa. 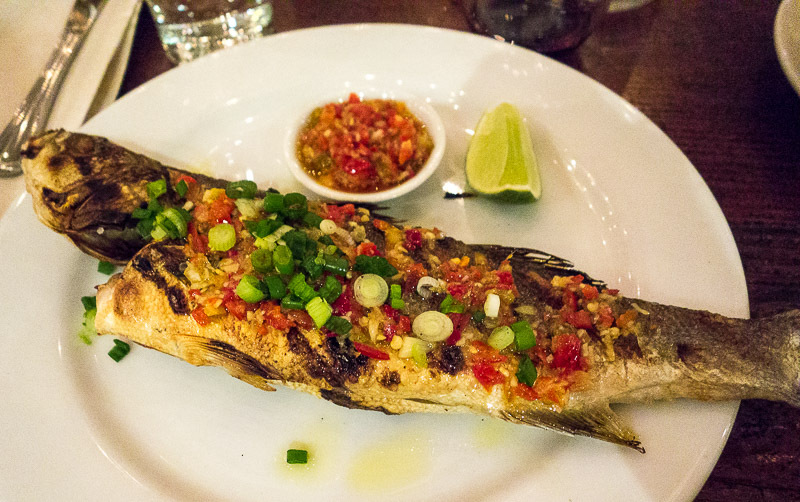 Mike opted for the Branzino, a whole fish grilled and served with a fresh salsa. Mike proceeded to give us all a lesson on fish farming, and how the Branzino is one of only 3 salt water fish that can be farmed and how all of them come from large operations in the Mediterranean. Then he ate every little bit of his dinner–they really know how to cook a fish here. Vaulting from the largely Asian influence on the menu, Gail had the Armenian Pizza. She claims it is research for Fat slice, I think she just likes pizza. 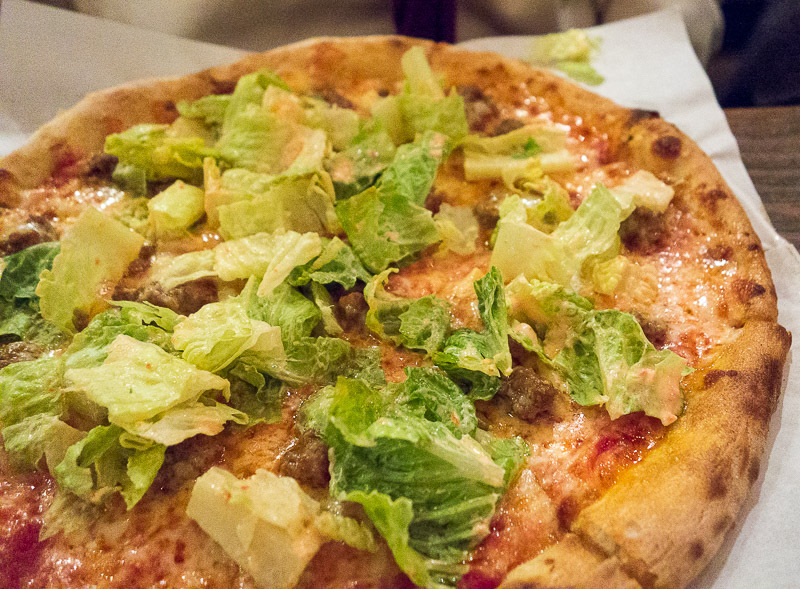 This one had ground spiced lamb, harissa yogurt, mozzarella, provolone, tomato sauce and fresh romaine. She ate the middle, I ate the crusts. Jack Spratt and the missus at work, I guess. There were no leftovers. 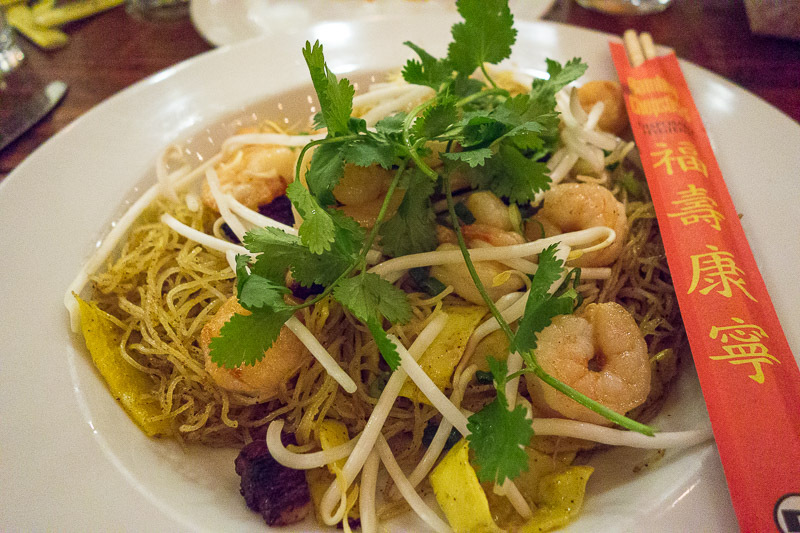 Timmy’s Singapore Noodles. They don’t say who Timmy is. I had to try something new, so opted for Timmy’s Singapore noodles. This turns out to be shrimp on top of dry noodles with madras curry, bean sprouts and char siu pork (which is like bacon but not as tasty. Definitely the least good part of the meal.) Eating noodles without a sauce is a new experience and takes a little getting used to. I can’t say I’m crazy about it, but I’d try it again. The curry was mild, not at all the overpowering yellow turmeric based curry one is accustomed to. Experimenting with new foods is always a gamble, but this was mostly a winner. 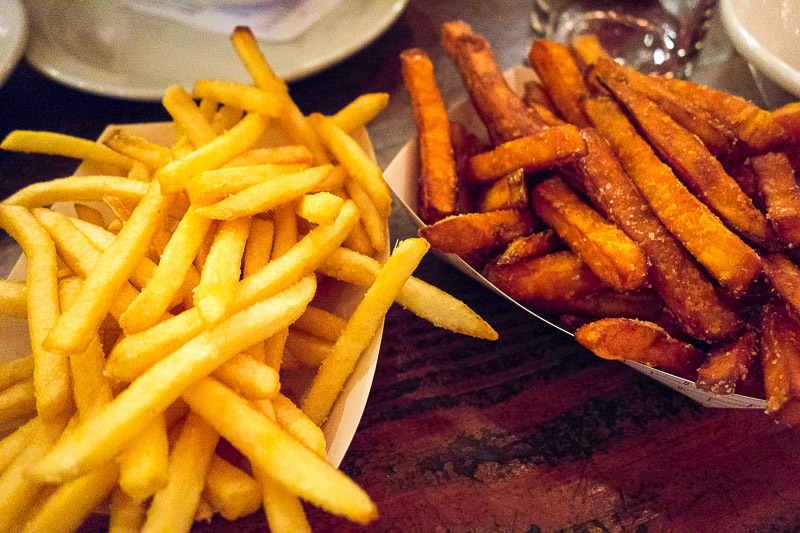 Regular and sweet potato fries. Kitchen Door has absolutely smashing fries. They are not on the menu. We were lucky to be there with a local who knows the place and ordered both. Not telling your customers about something you do this well is insane, but I’m not in charge. Regardless of what you want for dinner, order at least one side of fries. Prices are reasonable, service is casual and medium fast. It’s in Napa, so the wine list has to be good or the place would fold in a week. You can eat dessert there or walk out into the market and try some gelato or a gourmet cupcake. We had the gelato then cruised home. Another good dinner with Mike and Gretchen,.